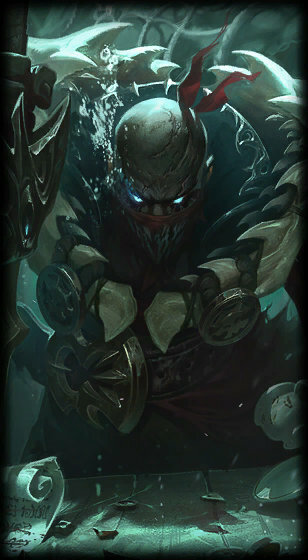 Surrender at 20: Pyke, the Bloodharbor Ripper, Now Available! "Another name off the list." - Pyke is now available for purchase! 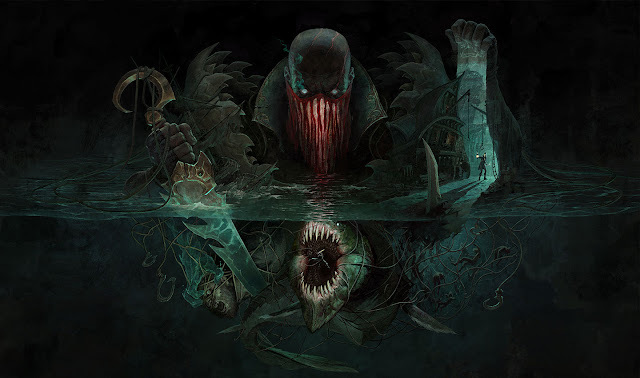 Pulling into port during the Curse of the Drowned event, Pyke is priced at 975 RP / 7800 BE and will drop to the standard 6300 BE price point after June 14th. 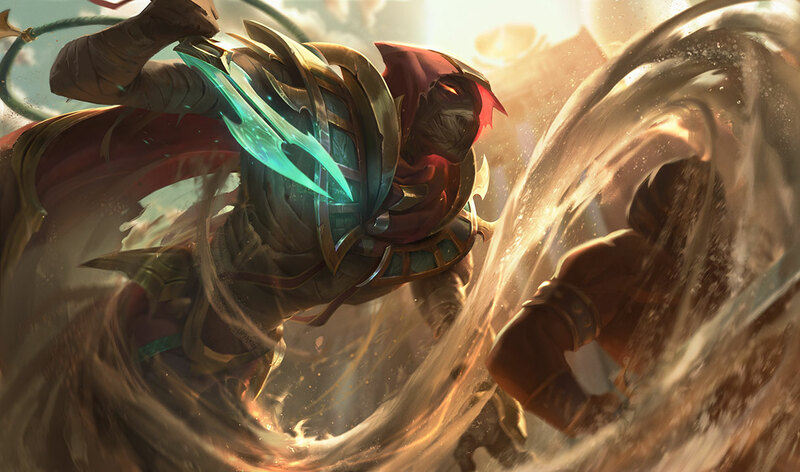 You can pick up Pyke and Sand Wraith Pyke in release bundle for 1837 RP for a limited time. 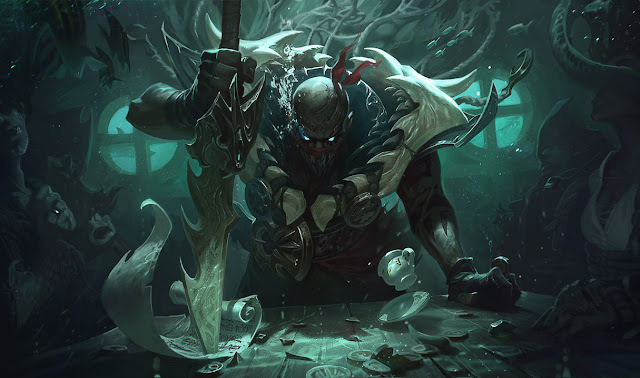 Continue reading to dive into more Pyke's gameplay, special interactions, and more! 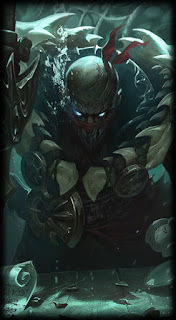 From the release announcement - "Pyke available now!" "He comes to rip. He comes to drown. Return to Butcher’s Bridge with a special Bilgewater-themed ARAM—the Curse of the Drowned eventis now live. Limited time missions, capsules, skins, and more are ready for you to plunder. 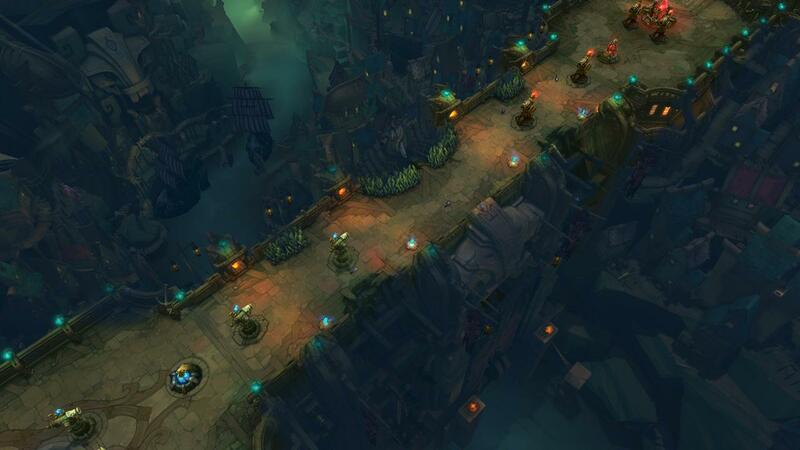 Pyke will also be available in the ARAM Free-to-play rotation through June 18th. 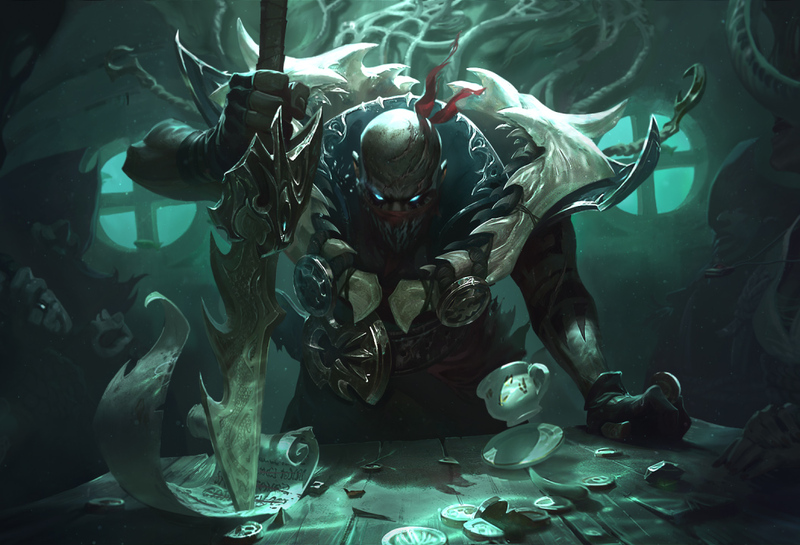 Before we sink into the kit details, check out Pyke's champion spotlight for a rundown of his playstyle and gamepaly. 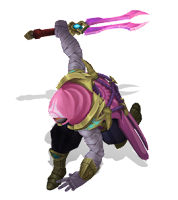 "If Pyke cannot be seen by enemies, he will rapidly regenerate [30 - 81%] of damage he has recently taken from champions, up to x.
Pyke converts all extra Maximum Health from any source into Attack Damage instead. 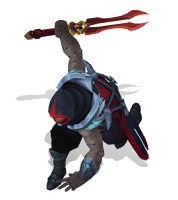 (1 AD per 14 Health - Currently: x)"
"Tap: Pyke strikes all enemies in front of him dealing x (+x) [115% of HOLD damage] physical damage. Hold: Pyke throws his harpoon, pulling the first enemy struck towards him and dealing 75/125/175/225/275 (+60% Bonus AD) physical damage. Tapping deals 50% reduced damage to minions and monsters beyond the closest." "Pyke gains Camouflage and 60/65/70/75/80% (+4% per 100 bonus AD) decaying movement speed for 5s. Stealth - Camouflage: Pyke is hidden from view while enemy champions remain outside his detection radius. Attacking or casting spells ends Camouflage." "Pyke dashes, leaving a drowned phantom behind him. After a short delay the phantom returns to Pyke, striking all enemies along it's path dealing 95/130/165/200/235 (+80% Bonus AD) physical damage and stunning for 1.1/1.2/1.3/1.4/1.5s." 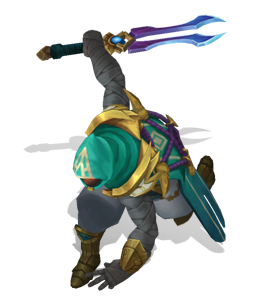 "Pyke strikes all enemy champions in an X, blinking to and executing targets below 190 - 655 (+60% Bonus AD) health. 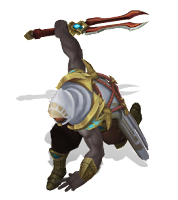 Enemies not executed instead take physical damage equal to the threshold. When an enemy champion dies in the X from any source, an assisting ally also gains full kill gold and Pyke may re-cast Death From Below again within 20 seconds. Gold granted to ally via an inventory item called "Your Cut". The execute will bypass shields if target is under threshold . "A renowned harpooner from the slaughter docks of Bilgewater, Pyke should have met his death in the belly of a gigantic jaull-fish; and yet, he returned. Now, stalking the dank alleys and backways of his former hometown, he uses his new supernatural gifts to bring a swift and gruesome end to those who make their fortune by exploiting others-- and a city that prides itself on hunting monsters now finds a monster hunting them." Additional lore on Pyke available on his universe page - including the short story THEN, TEETH , his champion bio, and much more. 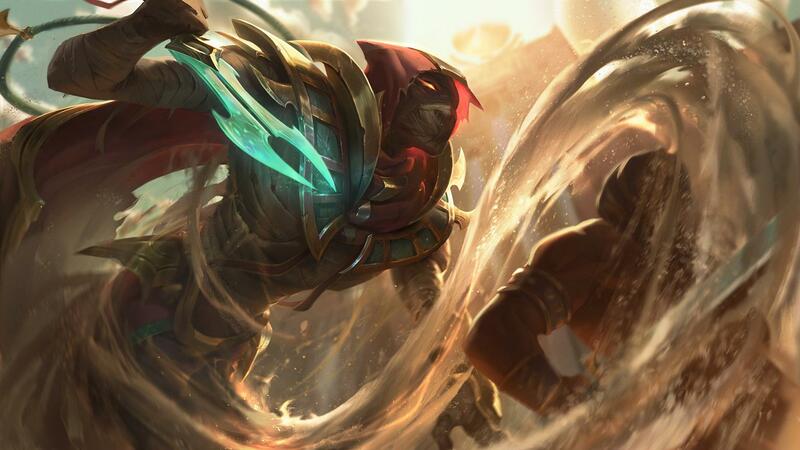 As seen in Pyke's reveal, his release skin is SAND WRAITH PYKE! In addition to Pyke, we also have a new ward skin featuring his dagger - The Ripper Ward. 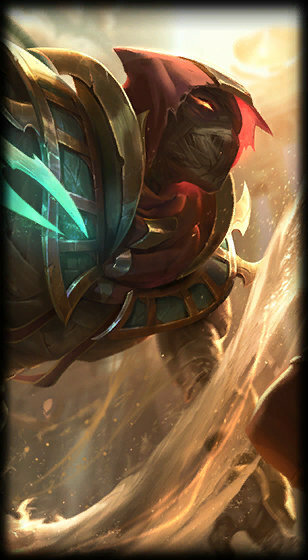 With Pyke's release, Vi's BE/RP price has been permanently reduced from 6300 BE/975 RP to 4800 BE / 880 RP. 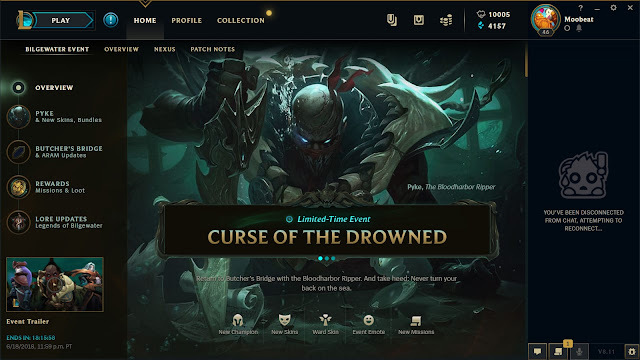 Curse of the Drowned Event Details [May 31 - June 18th] - also includes the return of Butcher's Bridge, new Diana and Vladimir skins, new missions, and more!